We all know the story of Noah and the Ark. "The Lord said Noah there's gonna' be a flood. And there's gonna be some water and there's gonna be some mud. Take off your hat Noah and take off your coat. Get Ham, Shem and Japheth and build yourself a boat. Noah said Lord I don't believe I could. The lord said Noah get some sturdy gopher wood. Ya never know what you can do till you try. Build it 50 cubits wide and 30 cubits high." Staler Brothers. You didn't grow up in my home without hearing the Statler Brothers singing on a daily basis, either at my house or my grandparent's. My favorite song of theirs? Well, no question it was Noah Found Grace In the Eyes of the Lord. I guess even at a young age I had the mind of a storyteller. As they sang the song I pictured Noah holding his palms out saying "but Lord, I can't" and the Lord putting his hand on his hip and saying "yes, you can". As they sing I see him pounding nails and herding animals, until the rain slices down in fat drops as he pulls the door closed in the nick of time. I could picture them floating aimlessly, until one morning they wake up and find themselves on a mountain. He lowers the door and the animals go out. They step out into the sunshine again and it's like a rebirth at that moment. "Don't be more trouble than you're worth." the Lord said. He probably did in His own way, but He already knew Noah would serve him because Noah hadn't seen the rain, but did as he was told and had faith. Faith is one of those things that ebbs and flows through us at different times and events in our lives. 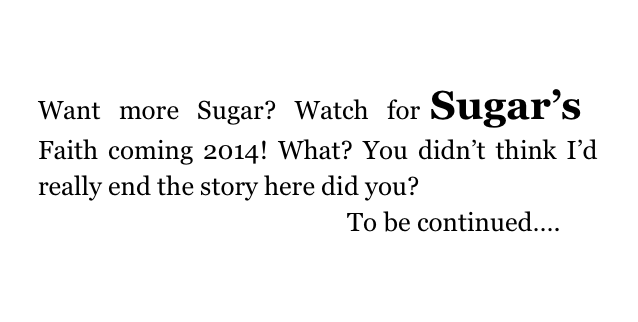 Last summer, when I was going to release Sugar's Night, it was supposed to be the final book in the Sugar Series. I struggled with that because it was Sugar, and I wasn't sure I wanted what she was in my life to end. As they say though, all good things come to an end, so I finished it and sent it out to the beta readers. They loved it, but not the ending. I figured out quickly it wasn't the ending they didn't like, they just didn't like that it was ending. So I pondered an epilogue that would tie everything up in a neat little bow, but when has anything in Sugar's life ever been neat? When have things ever been anything less than pure faith for her to follow Him? One night I had a dream. I was on a park bench (so cliche right?) and someone sat next to me. Couldn't see anything other than a dark shadow. 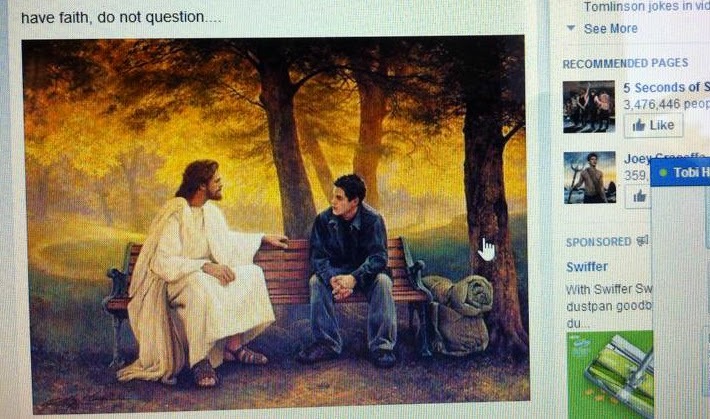 He said, "Now faith is confidence in what we hope for, and assurance about what we do not see." I'm not one who memorizes Bible verses, but I did know that was Hebrews 11:1. I think at that point I laughed a little bit in the dream and said, "Okay." But the voice said, "There is one more book for Sugar." I know at that point I laughed and said, "No one even reads the first two, the third isn't even out yet. Why on earth would I write a fourth?" And the voice said, "Because I'm telling you to." I rubbed my forehead a little bit and said, "I have nothing left to write about, Lord." I accepted at that point I was talking to Him. The figure stood then and said, "Noah didn't see the rain either." I woke up from that dream and finished Night that day. I released it with this message in the back. 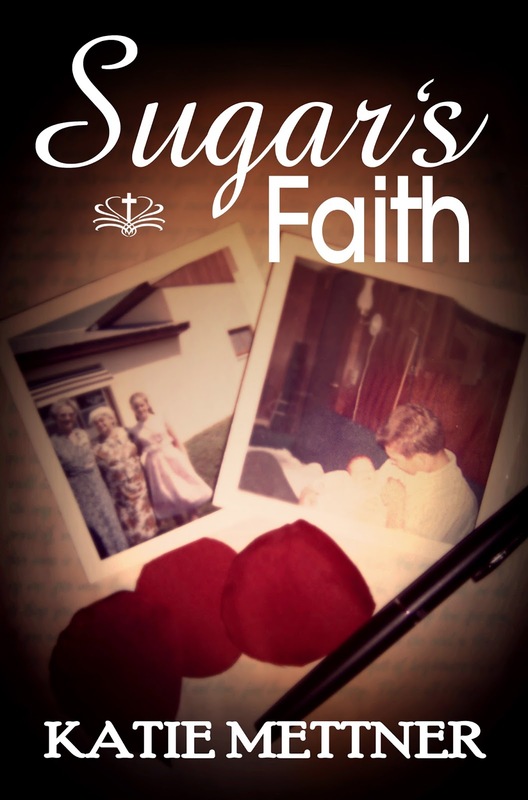 The fourth and final book will be Sugar's Faith. I'll be honest, I had very little idea what it was going to be about, so I wrote Granted Redemption first, giving myself some time to step away from Sugar and ponder this new development. Grant was finished, and I started Sugar's Faith. I wrote and wrote and 64,923 words later I still didn't know what it was about. At least I didn't feel like I did. So I said, "I'm done! The End!" So why did I have no great feeling of satisfaction? 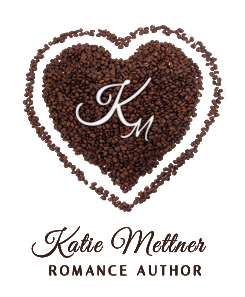 I ignored it and wrote Autumn Reflections, knowing I'd have to come back to Sugar's Faith and address it, but needing the comfort of telling a story of faith that I really knew and felt through my soul. I sent Autumn to the editor yesterday and all day I vacillated between just dumping Sugar's Faith in the recycle bin, making it just an epilogue and adding it to Sugar's Night or publishing it as a novella. Back and forth, back and forth until I'm pretty sure Tobi Helton (my sounding board) wanted to puke. So last night we were chatting about it on Facebook and when I refreshed from saying "Yeah cause the part in Ireland is REALLY REALLY good and the end is good, it's the middle stuff." this came up on my screen. Right, okay then. Freaky. I get it Lord. Noah didn't see the rain either. I went to bed last night determined that today I would open Sugar's Faith and tear it apart and make it what He wants it to be. Problem is, I still don't know what that is. So this morning I said to Tobi, "So do I open Faith and hope something comes to me or do I start Winter's Rain and wait for Faith?" Then this comes up next to the chat box.